The event will take place in the parking lot and on the sidewalk. Please be there at least hour before the event. We don't have the whole schedule of the event laid out yet so you may not play for the whole time but you will be paid for the whole hour. The event is taking place parking lot. It's also part of the nation wide protest against Trump and his immigration policy. El evento está teniendo lugar estacionamiento. También es parte de la protesta nacional contra Trump y su política de inmigración. Arriving on the music scene in the late 19th century, Mariachi Bands brought an upbeat yet traditional sound to Mexican culture. With a blend of guitars, violins, trumpets, the guitarron, and the vihuela, Mariachi music can truly liven up a party! The upbeat authentic Mexican folk music is the perfect accompaniment for wedding receptions, Cinco de Mayo parties, and so much more. 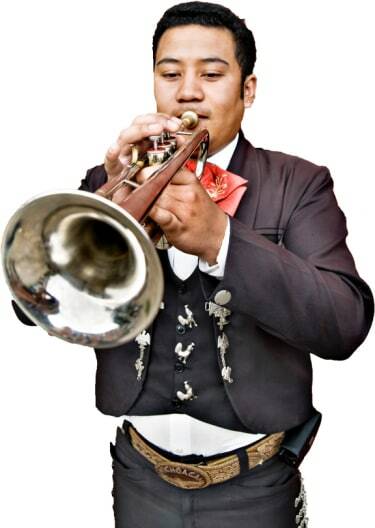 Search for Mariachi Bands in Elgin, Illinois above. Please note that these Mariachi Bands may also travel to West Dundee, Dundee, East Dundee, Sleepy Hollow, Wayne, South Barrington, Gilberts, Barrington Hills, Pingree Grove, Plato Center, Inverness, Wasco, Campton Hills, Barrington, Fox River Grove, Trout Valley, Medinah, Deer Park, Winfield, Lily Lake, Huntley, Lafox, Lake Barrington, Itasca, North Barrington, Hampshire, Oakwood Hills, Kildeer, Burlington, and Elburn.